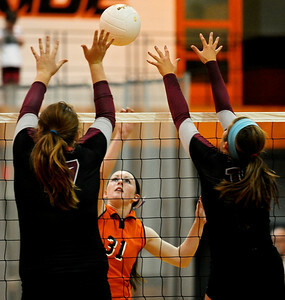 Prairie Ridge defeated Crystal Lake Central 2-0 at Crystal Lake Central Tuesday night. 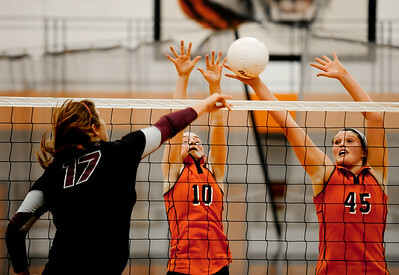 Josh Peckler - Jpeckler@shawmedia.com Prairie Ridge's Ali Witt (19) and Mackenzie Humm (12) block a attack from Crystal Lake Central's Kelly Harkins Tuesday, September 11, 2012 at Crystal Lake Central. Prairie Ridge defeated Central 2-0. Josh Peckler - Jpeckler@shawmedia.com Prairie Ridge libero Paige Dacanay (4) and Caitlin Brauneis celebrate a point against Crystal Lake Central Tuesday, September 11, 2012 at Crystal Lake Central. Prairie Ridge defeated Central 2-0. Josh Peckler - Jpeckler@shawmedia.com Crystal Lake Central's Lauren Leverenz (45) and Natalie Ricca (10) attempt to block a attack from Prairie Ridge's Maddie Drain Tuesday, September 11, 2012 at Crystal Lake Central. Prairie Ridge defeated Central 2-0. 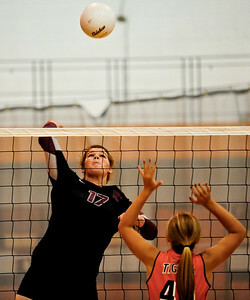 Josh Peckler - Jpeckler@shawmedia.com Prairie Ridge's Maddie Drain (17) goes up to attack the ball against Crystal Lake Central's Susan Jeziorowski Tuesday, September 11, 2012 at Crystal Lake Central. Prairie Ridge defeated Central 2-0. Josh Peckler - Jpeckler@shawmedia.com Crystal Lake Central's Kelley Harkins (31) tips the ball over Prairie Ridge blockers Maddie Drain (left) and Mackenzie Humm Tuesday, September 11, 2012 at Crystal Lake Central. Prairie Ridge defeated Central 2-0. Josh Peckler - Jpeckler@shawmedia.com Crystal Lake Central libero Kassi Dvoracek celebrates a point against Prairie Ridge Tuesday, September 11, 2012 at Crystal Lake Central. Prairie Ridge defeated Central 2-0. Prairie Ridge's Ali Witt (19) and Mackenzie Humm (12) block a attack from Crystal Lake Central's Kelly Harkins Tuesday, September 11, 2012 at Crystal Lake Central. Prairie Ridge defeated Central 2-0.